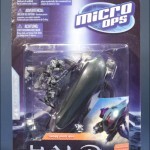 McFarlane Toys has released a bunch of new images and info for their upcoming Halo: Micro Ops toys. 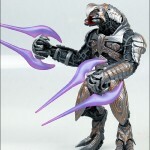 McFarlane Toys has posted images and info for Halo Series 8 and the Halo Mongoose Sets. This all-new version of the legendary Master Chief shows him as he appeared in Halo 2. Figure features the Chief in his new Mark VI armor, dual-wielding a pair of Brute Plasma Rifles — all features that made their debut in Halo 2. The squad leader of Halo 3: ODST, Buck comes with an Assault Rifle and features a McFarlane ODST figure first — a removable helmet. The darkened streets of New Mombasa are perfect for a Brute ambush, but the ODSTs have a secret weapon: VISR mode! This low-light amplification system outlines friendly units in green and enemy units in red. Figure comes with Brute Plasma Rifle and Spike Grenade, and features glow-in-the-dark paint (click here for more info and photos). The backbone of the UNSC military, the Marine is ready to join the ranks of your action figure force. Figure comes with UNSC Battle Rifle. Set before the Covenant Civil War, Halo Wars showed the alien Elites as a fierce enemy of mankind — and no Elite was more feared than the Arbiter, Ripa ‘Moramee. This all-new figure comes with dual Plasma Swords. Our first multiplayer Elite figure in Ascetic armor comes with dual Brute Spike Rifles and a paint scheme that complements the Elite Assault figure from Series 5. This Halo Wars Spartan features the early Mark IV armor in multiplayer-only black. Figure comes with dual SMGs and can be found at Target stores nationwide. Multiplayer Spartan figure comes with “Explosive Ordnance Disposal” armor and dual SMGs. 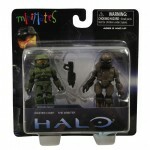 This Halo 3 figure will be available in a variety of specialty stores. This new version of Captain Veronica Dare features the secretive ONI Operative as she appeared throughout the events of Halo 3: ODST — without her distinctive Recon helmet. Figure comes with Suppressed SMG and Silenced Magnum, and will only be sold at GameStop stores. Orange Elite figure comes with Combat armor and dual Spike Rifles. This exclusive will be available in Toys “R” Us stores in the US and Canada. 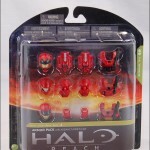 Halo Series 8 is scheduled to reach stores nationwide this June. McFarlane Toys’ first foray into 5-inch scale vehicles has been a huge success, leaving retailers and fans alike asking for more. We’re proud to deliver two new versions of the “M274 Ultra-Light, All-Terrain Vehicle,” better known as the Mongoose. This new version of the Mongoose features the 2-person vehicle as it first appeared in Halo 3. Vehicle comes with a Spartan EVA figure in multiplayer yellow and blue — the perfect color-coordinated driver for the yellow and blue Elite Flight figure from Series 7. Our first campaign Mongoose set is inspired by the story of the latest Halo game, Halo 3: ODST. Though not as powerful as a Spartan, Orbital Drop Shock Troopers such as the Rookie have a unique vision enhancement to make up for it: VISR mode. This low-light amplification system outlines friendly units in green and enemy units in red. This VISR mode Mongoose set is designed to go perfectly with the Brute Captain figure in Halo Series 8. 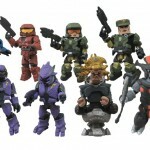 You can check out all of the Halo Series 8 and Mongoose Set photos by clicking the headline of the story.